There are almost 22,000 carrier sites, distributed across every province and territory in Canada. This includes cellular, microwave (MW), iDEN and combinations thereof. You can review and analyze all of these cellular, MW and iDEN sites — in many different ways — on any of our many reports. The Canada Cellular Services shows the 15,598 sites with least one cellular or iDEN antenna, and omits the 6,176 Only MW sites. 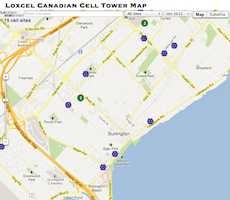 Would you like a custom cell tower map on your website, centered and zoomed over your location? The Canada Cellular Services now lets you add parameters to its URL, for zoom, lat and lon, which will zoom and center the map over your location of interest. Zoom levels between 11 - 14 are good for cities, and 15 - 18 work for neighborhoods. The carriers have been very busy lately. In just three days, they deployed nine new cell sites and 324 new antenna. So, yes, it appears that the carriers are building up and out that fast. The carriers sure are busy, struggling some would say, to feed all those new iPhone 5 and Samsung Galaxy S3 smartphones. Having trouble getting 3G or LTE coverage at home or the cottage? Consider installing a cellular booster. lower battery drain: a phone treats the booster as an in-house cellular site, and will dial down its output power. less exposure to cellular radiation: a phone needs 10 to 100 times less power to communicate with the booster, than a distant cellular site kilometers away. Our office sits in a densely populated suburb about 3 Km from the nearest cellular site. As a result, we routinely lose calls. So, we were happy to demo a SIG-009 cellular booster from Signifi. We mounted its indoor and outdoor antenna, making sure the outdoor antenna pointed to the nearest cellular site. (The Canada Cellular Services found three candidate sites. We chose one that had an antenna that pointed back to our house.) Finally, we ran the coax cables from each antenna to the signal amplifier and plugged its power adapter into the wall. The result: fewer dropped calls. September's update to the Canada Cellular Services is live. 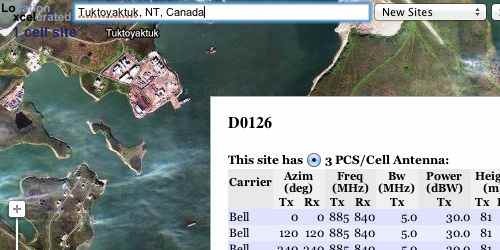 Among the 179 new sites, is a Bell site for the folks high above the land in Tuktoyuktuk. 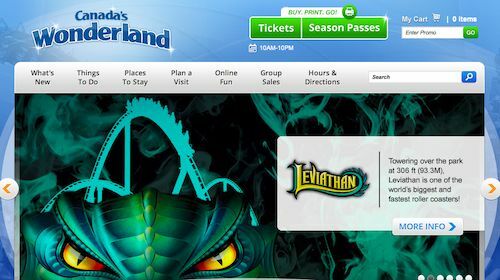 Last Sunday, as the Leviathan accelerated its riders to 140 kph down an 80 degree descent, the Mobilicity cell site at Hwy 400 & Major MacKenzie handled 5,000 calls. That works out to one call every 20 seconds. This site and the placement of its four antenna should provide stellar coverage throughout the park. A cell site is like an apple pie cut into three equal sized pieces (no cheating!). Each slice is a cell, serviced by its own antenna on a cellular site that sits in the middle of the pie. This crude (but delicious) example will help you understand the importance of a cell antenna's Azimuth. Look at the Azim column (above). Odd, but it looks like Mobilicity sliced their pie into four pieces — and they're not all the same size. The two antenna at 119 and 161 degrees point south-east and south, respectively, toward Canada's Wonderland. Roughly speaking, the 119 antenna covers the right half of the park, with the 161 antenna covering the left half. Curious about what the cell site landscape looked like six months ago? You can now see for yourself what has changed, by selecting Feb 2012 from the dropdown. Toggle between the two dates provided, to see what has been added — and removed. One tip: this new feature is available only on the desktop map. 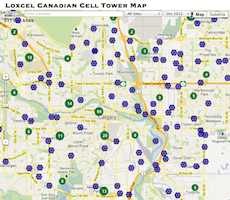 We have archived cell site databases back to 2009. If you need custom or historical reports about cellular sites or antenna, for a small municipality up to the entire country, please contact us for more information. Every month, we carefully make a few small changes to our data management processes. The purpose is to improve the quality of our cell site reports, which we supply to businesses and other organizations in Canada and the United States. The changes for August are to better identify the new cell sites that exist this month, but not in the previous month. Hopefully, the five new Mobilicity sites for Greater Toronto Area and three more for Calgary match the expectations of those Mobilicity enthusiasts out there. 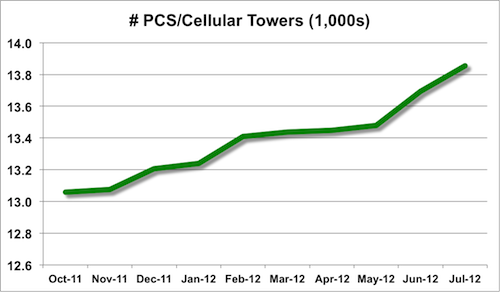 The two graphs below show the growth in PCS/cellular infrastructure across Canada, from October 2011 to July 2012. 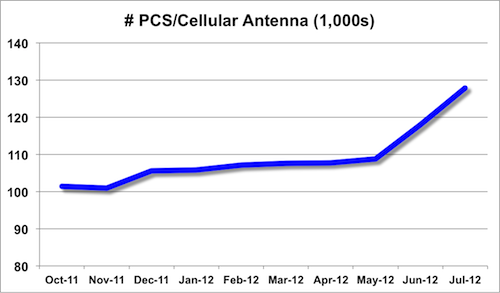 During this period, PCS/cellular antenna counts increased 26%, from 101,344 to 127,856; site counts increased 6%, from 13,058 to 13,855. July brings hot weather and and updated Canada Cellular services. Site count increased by 45, to 13,755. We have added another data quality check to our cell site data workflow. 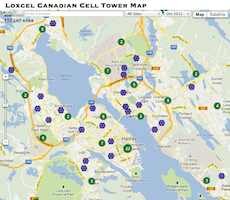 Certain cell sites that previously appeared multiple times on the map, are now consolidated. The result is a reduction in cell site counts, from 14,968 down to 13,610 (for June). This reduction has caused some sites to grow, with additional antenna and carrier infrastructure. Our June update includes 14,968 cell sites. This tweet from Mobilicity says that cell coverage is influenced by antenna height, power level and other things. Information is shown for the transmitting (Tx) and, where applicable, receiving (Rx) antenna. As far as we know, no other service provides this kind of information. But, sometimes you don't need this detailed information to determine coverage. Say, you are a Rogers customer planning a trip to Newfoundland. You position the map over Newfoundland and use the filter to show only Rogers cellular sites. It's perfectly obvious that you'll be fine around St. John's but out of luck anywhere else, say in Saint Anthony, on the northern tip of the island. In short, sometimes the simple presence of a cellular site is enough; other times, you need to dig a little deeper. Either way, the Canada Cellular Services has you covered. 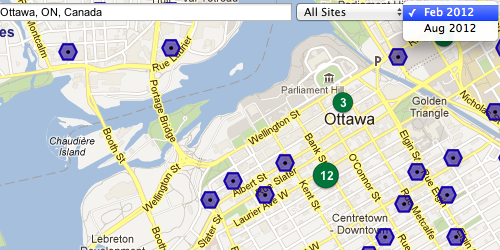 Added 10 Mobilicity site (30 antenna), for the period from 8-May to 15-May. Want to see Mobilicity site adds since 1-April? Just locate the filter at the top of the Canada Cellular Services, and select New Mobilicity. (This filter has options for other carriers too.) You should see 29 sites in Vancouver, 16 in the Greater Toronto area, two in Ottawa and Edmonton and one in Calgary. 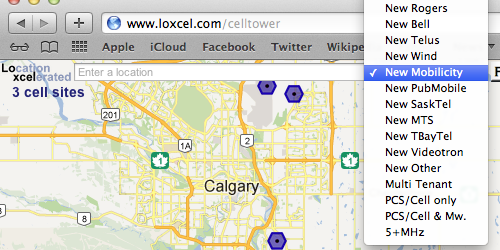 The second update is to the cell site icons we added on 17-May-2012. A few people liked them — thought they looked cool. Others thought that the pink icons (pink? they looked red to me) were a bit too big and disjoint. Anyway, the icons are now blue and a bit smaller. Roaming agreements for SaskTel and TBayTel are now gone. The markers you now see are strictly those owned by the carrier. So, if you filter the map by any of these carriers, you will see fewer markers than before. Another change concern the filters PCS/Cellular and Microwave. 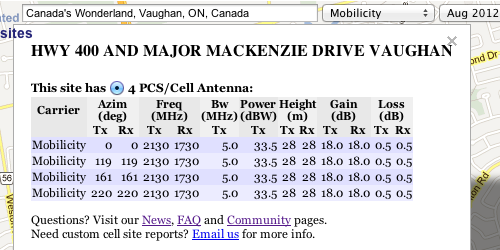 Both now show sites that have at least one of these kinds of antenna. And to be a bit festive, we changed the cell site icon. It's now a red hexagon. (Clusters remain green circles with numbers printed on top.) How does this look to you? Today's changes to the map mean better quality data, better analytics, new microwave sites, and more antenna information. The second change is better analytics, which take the form of 31 cell site filters, which you can select from the drop down at the top of the map. Select a filter and the map will instantly refresh accordingly. Another change is the inclusion of Microwave antenna. The map used to show only the PCS/Cellular antenna that communicate with your mobile phone. However, some cell sites also include Microwave antenna, which form a backhaul to route calls and data back to the carrier's back office network. Some cell sites contain only PCS/Cellular antenna; some sites contain only Microwave antenna and others contain both. All are now on display, in the same info window. For sites with both kinds of antenna, use the radio buttons to switch the view between each. The last change is more information. This feature is active only when you're on a desktop or notebook computer. The information includes complete technical details of each antenna at that site.